"Eating as Though the Earth Matters" column. In my December-January column, we looked at the interconnections of all the justice movements—peace, earth, social justice, and animal rights. 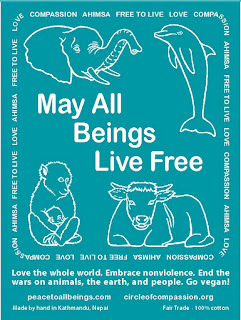 Each movement is seeking to create peace, justice, and a world healed from the ravages of greed and fear. Synchronistically, in the same issue of Planet Kansas, Bob Summer reported that the Kansas Chapter’s Executive Committee made an October, 2011, recommendation to the national Board that Sierra Club adopt an anti-war resolution. The resolution they recommended would include withdrawing U.S. forces from Iraq and Afghanistan and also downsizing military presence overseas. Why would an environmental group take a stand on war and peace? As Sommer points out, wars and military occupation take a huge toll on nature. Daily use of millions of gallons of oil, destruction of habitat with weaponry and military installations, fouling of water supplies, and an endless list of heart breaking atrocities add up to extreme environmental degradation. In the same issue of Planet Kansas, Craig Lubow shared with us the connection between environmentalism and human rights. He reported that the Sierra Club joined Amnesty International to co-produce a video on the subject. Some of the worst environmental catastrophes have taken place where people are impoverished. Mining, oil, animal agriculture, fishing, and other industries often invade areas where people are few and/or have little influence to stop the destruction. Multinational corporations, responsible for death and appalling pollution, toxic waste, and the destruction of livelihoods, do all they can to ignore the trail of tragedy that they leave in their wakes. So while we work within our own organizations to further planetary healing, and as the Occupy movement continues to underline all these intricate interconnections, we find ourselves working together more often than ever. This beautiful planet is both literally and symbolically our common ground. I recently ran across yet another example of a threat to the earth that requires cooperation from all of us. In a Huffington Post online article by Tom Zeller entitled, “Biodiversity on earth plummets, despite growth in protected habitats” (9-29-11). In it he explains that, in spite of the increase in designated protected habitat areas, species diversity is still dropping. Since the ‘60’s 7 million square miles of land and 1 million square miles of sea have become protected areas. 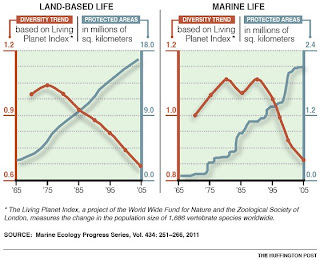 As you can see in the charts, both land and sea species have disappeared at an alarming rate in spite of the increase in these areas. We are looking at huge numbers of people working so hard, many as unpaid volunteers, to protect these areas, and yet it does not seem to be enough. And, of course, as we know, species diversity is not just about saving the animals for their own sakes, it is also about saving life on earth in general. In other words, this loss affects human beings as well and in every way. The delicate balance created by the interconnecting dance of species is key to our survival physically. Spiritually and emotionally, the loss of these animals in our world creates a profound underlying sense of grief for us all. There are simply too many angles from which the diversity of life is being attacked. Habitat protection is vital but not enough. As we have discussed, wars contribute mightily to habitat destruction as does the pollution caused by the multinationals. We have now seen the birth of the 7 billionth human being. In Lawrence, Kansas, I watch as trees, grass, and animal homes and food sources are stripped from the land to make room for more condos, big box stores, and apartments. We are truly at a crossroads like no other. Loss of species diversity sounds very scientific. We can say it without much emotion, but what lies beneath the euphemism is the fact that innocent animals are dying, beautiful plants are being ripped from the earth, and the delicate balance of life itself is in grave danger. So we see how these animals are dying because of wars, human rights violations, corporate greed, relentless pollution, but this, after all, is a column about eating as though the earth matters. One of the most invasive of all industries on earth is the animal agriculture industry, and I include the fishing industry in that. Bison, wolves, wild horses, coyotes, prairie dogs are all legally and ruthlessly killed to “protect” land for cattle. When we eat cow meat, we contribute to the deaths of those wild animals and the damage done to the ecosystem by cows confined in spaces too small for them. Approximately 60% of all grain raised in the U.S. is grown for animals who are confined in feed lots, factory farms, so-called “humane” farms, and fish farms. Much of this grain is genetically modified which, as you know, is compromising the integrity of insect populations that are essential to pollination, not to mention the beauty of flowers. When we dine on cows, pigs, chickens, turkeys, and other animals, we contribute to the loss of habitat that has been taken over to raise this feed grain, to the proliferation of the GMO industry, and to the deaths of butterflies. 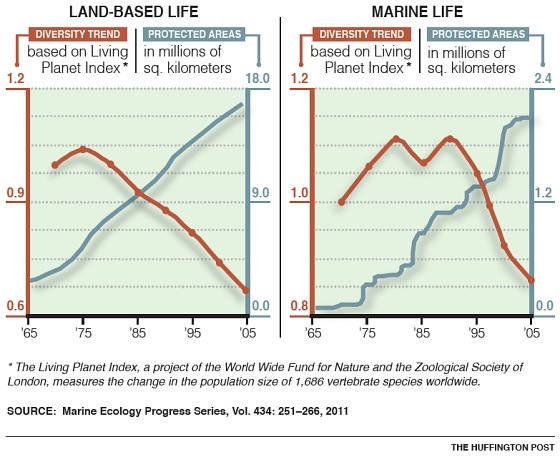 It is no longer news that overfishing is threatening the ecological balance of earth. Huge fishing fleets are bent on profit without ethics. It is estimated that in the U.S. alone in 2010, Americans consumed an estimated 53 billion aquatic animals. When the customer will buy, the corporations will provide. According to Sea Shepherd, of TV’s Whale Wars fame, a bluefin tuna recently sold for $173,000.00. Evidently prized by sushi lovers especially in Japan, this magnificent fish is surely doomed to extinction at prices like that. And let’s not forget, as we consider the infinite interconnections in the web of life, that land animal agriculture and aquaculture is polluting the rivers and seas with untreated and unmonitored excrement which is full of pathogens, antibiotics, and toxic medications. • 9.2 billion chickens were killed for meat. • 464 million chickens were raised for eggs and killed when they no longer produced enough eggs. • 276 million turkeys were killed for meat. 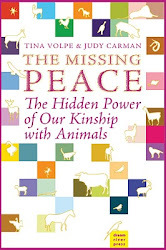 • 202 million cows, pigs, other mammals, ducks and geese were killed for meat. • 53 billion aquatic animals are estimated to have been killed for food. Globally, U.N. Food and Agriculture Organization figures indicate that the number of land animals killed for food exceeds 65 billion. The organization does not have global estimates for aquatic animal deaths. Let us imagine for a moment the immensity of these numbers just for land animals alone. The amount of space and feed needed to raise these animals; the amount of pollution from their contaminated excrement, blood, body parts, and diseased carcasses: the amount of water needed to sustain them and then slaughter them; the fuel needed to transport them and their remains—well, you get the picture. Can anyone argue that that is sustainable? If human beings continue to eat animals, we will be eating them and our planet. What I love most about writing this column “Eating as Though the Earth Matters,” is that in spite of all the dire facts, predictions, and sad news, I get to offer something amazingly simple and optimistic that each one of us can do to make a big difference for the earth, the animals, social justice, world peace, and even our own health. Without taking any extra time or costing any more money, activists all over the world can continue the great work they are doing and take an immediate stand three times a day (or more if you eat a lot of snacks). Eliminating animal products from our meals directly impacts big agribusiness and big fishing—two of the most destructive industries on earth. As I have called it before, it is the mother of all boycotts, and we have the power to do it. It is a power that comes from the heart of us all, generated not by greed or fear, but by love for life, for this miracle we call earth, for our grandkids that they may wade in crystal clear creeks and see butterflies. In the words of Martin Luther King, Jr., “True pacifism is not unrealistic submission to evil power. It is rather a courageous confrontation of evil by the power of Love.” That is our power. as we go forward in solidarity with each other.